Since the beginning of manned flight, it has been recognized that supplying the pilot with information about the aircraft and its operation could be useful and lead to safer flight. Original analogue instruments are operated by air pressure and the use of gyroscopes. There are three basic kinds of instruments classified by the job they perform: flight instruments, engine instruments, and navigation instruments. Flight instruments - the instruments used in controlling the aircraft's flight attitude are known as flight instruments. These are basic flight instruments, such as the altimeter that displays aircraft altitude; the airspeed indicator; and the magnetic direction indicator, a form of compass. Additionally, an artificial horizon, turn indicator, and vertical speed indicator are flight instruments present in most aircraft. The center position directly in front of the pilot and co-pilot is the basic display position for the integrated flight controller (airspeed indicator, turn and bank indicator) or artificial horizon. Engine instruments are those designed to measure operating parameters of the aircraft's engine(s). These are usually quantity, pressure, and temperature indications.They also include measuring engine speeds. The most common engine instruments are the fuel and oil quantity and pressure gauges, tachometers, and temperature gauges. Navigation instruments are those that contribute information used by the pilot to guide the aircraft along a definite course. This book is hard cover of 37 pages. Only the last 2 pages are numbered as 38 and 39, but I counted the pages. 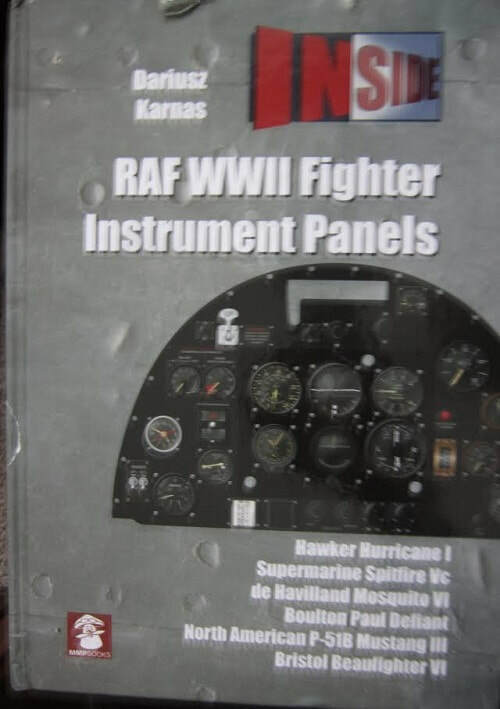 The cover art shows a color illustration of the Supermarine Spitfire Vc's instrument panel and a listing of what panels are featured in the book: Hawker Hurricane I, Supermarine Spitfire Vc, de Havilland Mosquito VI, Boulton Paul Defiant, North American P-51B Mustang III and the Bristol Beaufighter VI. The back cover shows small color illustrations of these 6 instrument panels. The book is in 8 1/4" x 11 3/4" page format. Text and illustrations are across the 11 3/4" width, so you have to turn the book side-ways to read it. The Hawker Hurricane section begins with a history of the aircraft and a black and white and a color photo of the actual instrument panel. The next pages have a large color illustration of the instrument panel and a listing of the names of all the instruments. This is followed 3 pages showing individual collor illustrations of 18 of the instrument guages. The Supermarine Spitfire Mk. V section begins with 2 black and white photos of the aircraft actual instruments and the history of the Spitfire. This is followed by a large color illustration of the instrument panel and a listing of the names of all the instruments. The next 3 pages have color illustrations each of the 18 instrument gauges. The de Havilland DH.96 Mosquito section begins with the history of the aircraft and a black and white and a color photo of the actual instrument panel. The next 3 pages have color illustrations of the individual 12 instrument gauges. The 4th page has a large color illustration of the 12 instrument panel and the names of each of the instruments. The Boulton Paul Defiant section begins with the history of the aircraft, a black and white photo of the actual instrument panel and a black and white photo of a actual panel frame that is being preserved in the RAF Museum. Next is a large color illustration of the instrument panel and a listing of the names of each of the instrument guages. The next 3 pages have color illustrations of 18 of the gauges. The North American Aviation P-51 Mustang MK. III section begins with a history of the aircraft and a black and white photo of the aircraft's actual instrument panel. This is followed by a large color illustration of the instrument panel and a listing of the names of all of the gauges. The next 2 1/2 pages have color illustrations of each of the 16 guages. The Bristol Type 156 Beaufighter section begins with a history of the aircraft and a color photo of a cockpit interior being restored at Duxford, UK. The next page shows 6 color illustrations of each of the guages. This is followed by 2 pages that have a large color illustration of the instrument panel and a list of the names of each of the gauges. Then 2 more pages showing color illustrations of 7 more guages in the Beaufighter. This is a very well illustrated book and highly recommended. I want to thank the folks at Stratus in Sandomierz, Poland that sent me this sample. Stratus does the printing of all of the MMP books in English. They also print their own line of books in both Polish and English.